Yes, I am calling myself an expert. On Dragon energy no less! But it’s true! In fact, I may be the only Dragon energy expert around. So, if you’re suddenly wanting to understand everything there is to know about Dragon energy for some reason (#Kanye), seriously what choice do you really have? If it makes you feel better, there are millions of people who’d vouch that I do qualify as an expert here—you’ll understand why in a moment. Okay guys, let’s get into it. First off, the idea of Dragon energy is some pretty metaphysical stuff. To understand it you must think objectively, get into a ‘higher self’ frame of mind. You need to suspend any thoughts of politics in what I am about to say. Seriously. ‘Politics’ is such a low energetic concept to begin with, it really doesn’t apply here with what we’re talking about, at least not the way you might think it does. Just open your mind. Be the unattached observer. Also, try to be aware of any ‘thought programming’ you might have. Feelings of being ‘triggered’ by anything I say will let you know if this is happening and you’re moving into ego. Just shift back to your higher self. Okay, about 3 years ago I started writing what is, at this very moment, becoming an internationally best selling YA trilogy called The Oldest Soul; a story in which all of humanity gets divided up by their energetic DNA imprint, or soul age, into either New or Old souls (to be pitted against one another, obviously). There are 4 types of New souls, and 5 types of Old souls, the second oldest of which is, you guessed it, DRAGON energy. The astonishing thing about this is the description of “Dragon Souls” in the back of book one. I couldn’t have known it at the time, but I was writing what all reads like a prophecy now. A foretelling of this intense awakening so many agree is clearly upon us. You’re able to access divine abilities for building and creating human achievements to previously incomprehensible new heights in the realms of music, technology, corporate leadership, or even the alliances of nations! From Taylor Swift (Taylor instead of Kanye, ironic glitch in the matrix) to beloved Presidents to fearsome dictators, Dragons know that their words and actions are as powerful as a breath of fire; you can burn down the world if you want to, or you can save and protect it from the greatest most seemingly insurmountable threats … namely, other Dragons. You may be a Dragon of Light but may know a Dark Dragon as often these types of souls are attracted to each other to learn lessons of power. Dragons have the deepest awareness of the distinction between good and evil of any other soul type. You have the power over your own will and that of others too, you can flip opinions and change minds (hello??). In fact, you can feel your hand resting on the switch (or tweet button) You might also feel a little elastic inside. Because of these distinct feelings, some Dragons can come across as rigid and overly steadfast in their ideals. All Dragons can be masters of illusion when they choose to be; able to spin intricate webs without any effort and easily causing hurricanes of confusion to those around them. It’s one of their most distinctive traits. You can pull power, influence, money, or anything else you want out of the universe … and you probably already know it. One day you’ll suddenly tire of the energy expense of being a Dragon and soon after become a Mountain Soul! Your soul age becomes your identity in the new hit novel Animus. So, where did this description come from? And how does it manage to eerily describe both Kanye and Trump, and maybe even you? And even more importantly, what does it have to do with the apparent apocalypse seemingly upon us? 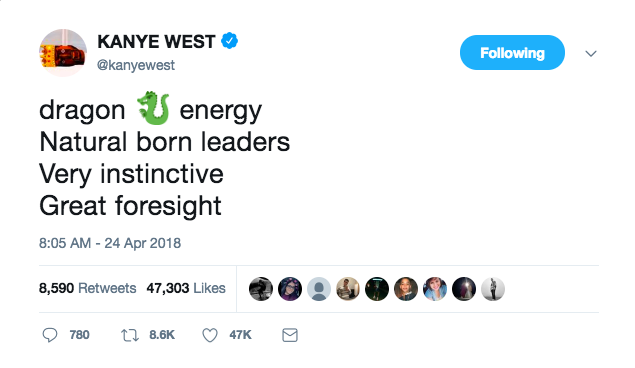 Dragon energy is a very high form of consciousness, from a space closer to source, a matrix ‘beyond thinking.’ Which makes Kanye’s tweets about freedom of thought and not thinking at all, and Trump’s gut instinct M.O. of purely shooting from the hip, some pretty fascinating stuff to ponder (if you can do it in an unattached fashion). Particularly the ways in which both these things seem to trigger people so intensely and so personally. Dragons or those with Dragon energy are what is cosmically and universally known as ‘the gatekeepers of our next journeys.’ Known esoterically as Masters of Peace (Nobel, anyone? God this is getting weird!). As well as Masters of The Light; they can wield it at will, like Luke Skywalker wielding his light saber. It all comes together when you understand why their souls have incarnated here. Dragon souls come to show us how to direct energy for creation (and dark dragons come to prevent us from knowing how to direct the energy of creation. Transhuman agenda anyone?) Alright so, masters of peace and light, here to show us how to tap into our power of creation. So think peace and light and creation. Hmm. Did you know that at the moment when conception happens there is a flash of light? If it can be defined in terms of energy, what is creation? I interpret ‘the energy for creation’ as love. We came from love, and those who have near death experiences report that we return to love. And love is a zero sum game. True love is unconditional. ALWAYS. Full stop. Hence Kanye’s love for everyone from Candace Owens to Emma Gonzales. From John Legend to Donald Trump. I’m not going to get into like crazy specifics on this but basically, this was all foretold. Prophesized through the ages. That one day all false things would be destroyed (H’wood, Washington elites, global elites, the church, the fall of the dark dragons) and an enlightenment would be born, an awakening so great it will usher in a new time called The Golden Age. And guess what? All this begins with the return of the Dragon energy!!! Needless to say, Kanye’s tweet got my attention. From the writings of the Rosicrucians to the Assyrians, to the Tibetan Book of the Dead and the Bible, all across the board it’s said that Dragons will be showing up and making their presence known over the the earth. That this happens shortly before humanity basically ascends to the next level of consciousness, without getting too technical here, obviously. That’s how I interpret it anyway (even and especially the Book of Revelations). Though it’s worth noting that in none of these ancient texts did they specifically use the words Twitter, Kanye or Trump. Well it does mention trumpets, which reminds me of a funny meme I saw recently. I also think it’s up to us. If we decide, look it’s time to create a human paradise, to go to the next phase of our journey, then boom that’s what we do. But I do think that the recipe for ascension is this: Peace + Light = Creation. Once we learn that we can and already are creating, we can direct it and create whatever we want! So, whoever is touting and teaching those things we might want to keep an open mind about. Now, I am not saying anyone is here to save us and I’m not saying anyone is quote good or bad. That dualistic paradigm is as over as Harvey Weinstein’s career. It’s of the old world. Let the polarized world go. The truth is that the presence of Dragon energy, more than anything else, shows up to reveal you to yourself. It teaches what needs to be taught, however those lessons need to be taught to each person. Another reason people’s varying and dramatic feelings about everything happening is so interesting. I’ll leave you with a few thought provoking passages I scrounged up for you to mull over, and I really encourage you to research these things on your own. See what resonates with you. And of course, if you want to know how it all ends, read my books!! When the Dragons appear, do not expect to see reptilian, fire-breathing monsters. They will come in human form. Their origins are ancient, having emerged from primordial water and fire straight from the womb of existence. Although they are massive in size and have huge wingspans, their translucent skin and crystalline bodies allow them to move about unnoticed for they appear like wind on the surface of the water. The Dragon Awakens. The Dragon Emerges. The Dragon Reveals. As a note, the descriptions of the different soul energies and the novel trilogy, like all art, come from my imagination (i.e. the collective unconscious) and combine religious, esoteric, and prophetic texts which the main character Eve uses to solve the mysteries of time, creation and ascension. Crazy cool stuff Tiffany ! Dear Tiffany, Thank-you. ❤️ thank you for your books and your words and your beautiful soul. My journey has been so challenging! Synchronicity and the higher being led me to you. You my dear have aided me so much. You are an angel changing the world and you’ve certainly changed mine so thank you. 🙏 ..